In Part 3 of Pavel Tupitsyn's series, he covers the cache queries: Scan, SQL, LINQ, and Text. This part covers cache queries: Scan, SQL, LINQ, and Text. Cache queries provide a way to retrieve multiple cache entries based on a condition. SinceICache<K, V> implements IEnumerable<ICacheEntry<K, V>>, the simplest way to find some entries is to enumerate the cache (via foreach or LINQ to objects). ScanQuery: user-defined filter predicate is sent to remote nodes, executed, and matching entries are sent back. SqlQuery (and SqlFieldsQuery): write SQL as you will do normally, and Ignite will take care of executing the query on multiple nodes and aggregating the result. TextQuery: Lucene-based full-text search. Similarly to SQL, you write a query in Lucene syntax, and Ignite takes care of executing it in a distributed manner. And the output is CacheEntry [Key=2, Value=Person [Name=Jane Moe, Age=43]]. Notice that we had to register PersonFilter in the BinaryConfiguration, because this filter is sent over the wire to remote nodes and needs to be serialized. Scan queries are the simplest form of distributed queries, do not require any cache configuration changes, and allow any user-defined logic in the filter. However, they are limited to simple data filtering; there are no projections, joins, or aggregates. SQL Queries require explicit configuration. We need to tell which types and fields should be available in SQL queries. And the output will be the same: CacheEntry [Key=2, Value=Person [Name=Jane Moe, Age=43]]. Queries are parametrized with ? symbol, and parameter values are provided in the same order after the query text. SELECT and FROM can be omitted since there is only one SQL-enabled type in the cache, and we don’t select individual fields. Notice that we still use a single NuGet package, our program fits on-screen, and we run a full-fledged SQL over our custom data. How cool is that? Person is the name of our class without namespace. Here we select individual name field, so the output looks like Jane Moe. Notice that SQL schema name is the cache name. Since we call QueryFields on personCache,persons is the default schema, and orgs has to be specified explicitly. During Ignite startup, a new browser window will open and show the current state of the H2 database on the current node. You may have to wait for caches to start and refresh the browser. Note orgs and persons SQL schemas and table names. As you can see, besides configured SQL fields, there are predefined _KEY and _VAL fields which contain entire cache key and value objects. 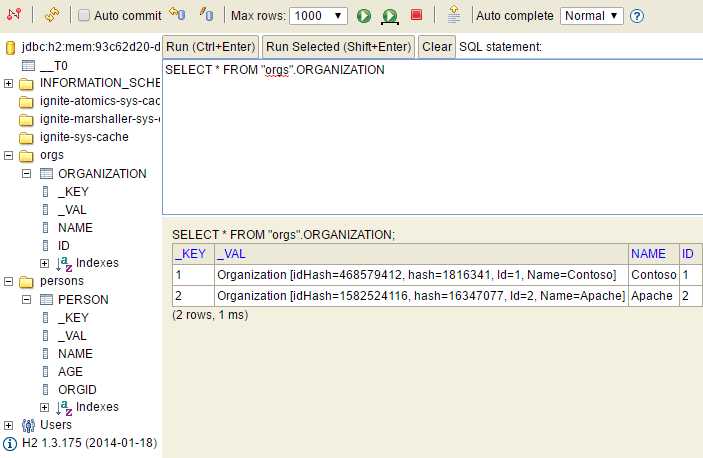 H2 console can be used to try out SQL queries at runtime. However, keep in mind that these queries are local only. In multinode scenario, with Partitioned cache, only part of the data will be shown. where person.Value.OrgId == org.Value.Id && org.Value.Name == "Apache"
This will match both John Doe and Jane Moe. You can learn more about Lucene syntax on their site: lucene.apache.org. We have explored enough Ignite cache features to start building some real-world application. Next time we’ll design a data schema for a simple social network and start implementing it.